Throughout Massee’s career he applied for more than thirty-four commissions. He succeeded in actually constructing five. The Giant Plaza in Beijing, Incidence At Large in Milwaukee and Plaza Incidence in Toronto are three that were constructed in public settings. ...down here the local selection committees tend to western art. They have been inured to this genre for hundreds of years and when they think of Sculpture they think of cast bronze men and horses or sappy depictions of frontier life. The more sentimental the better. I have been working on what it is in western art that fascinates so. I’ve come to the conclusion that it is safe. Everyone can tell exactly what is going on in the sculpture, no surprises. I think it stems from peoples lack of Scuptural education and their remembrance of their childhood. 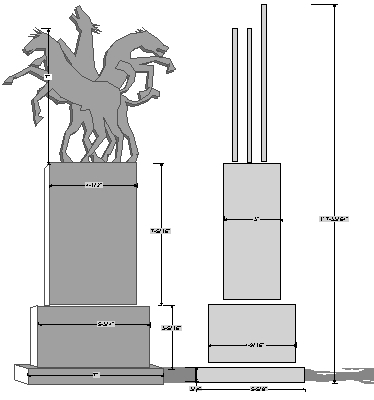 Boys would play with toy soldiers and girls with dolls.....anyway I’ve been working on a series of equestrian monuments that involve action and drama! They maintain an enigmatic quality and don’t give one everything visually, there is something left to the imagination. Something for the viewer to grapple with. 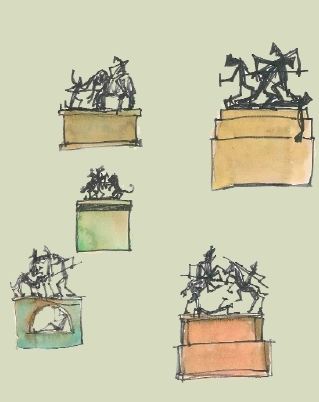 Massee designed groups of Sculptures that created an environment, a Plaza, a space defined by its’ objects. His concern about what he perceived to be a public desire for drama and accessability was resolved by his equestrian series. This series involved the use of horses with or without riders on classic bases. The scale of these Scuylptures and their proximity to each other created a series of alleyways and cul-de-sacs that one could wander and get lost in. ?The inclusion in these groupings of Massee’s Giant figures on their bases adds an element of mystery, of enigmatic wonder. 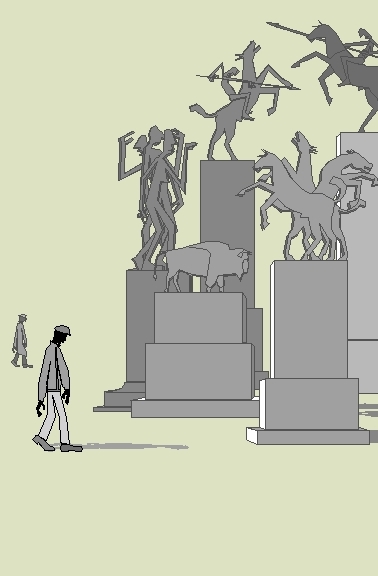 The scale of the Giant figures is greater than the scale of the equestrian Sculptures. This lends a feeling of discord and inexactitude to the whole group. 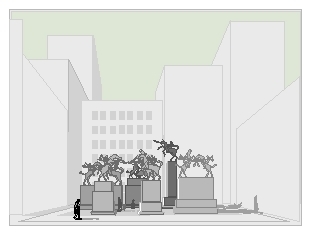 This incongruence of scale takes the Sculpture as a whole, The Plaza, to a different mode of Sculptural awareness. It removes the work from the Western Art Genre and palces it somewhere else. 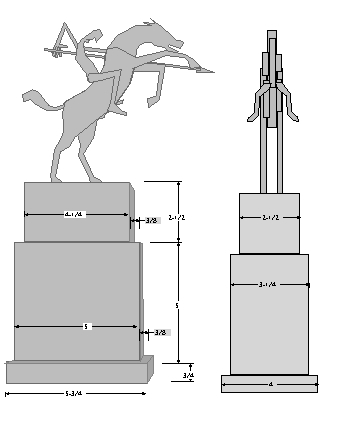 Massee uses many of the motifs of Classical Equestrian depiction in these designs. The three horses in the rear of this image are typical of greek relief sculpture and vase painting where the horses pulling a chariot or arrayed against an enemy are all the same and layered atop one another. This gives an appearance of order, strength and unity. The use of spears was a new developement for Massee. 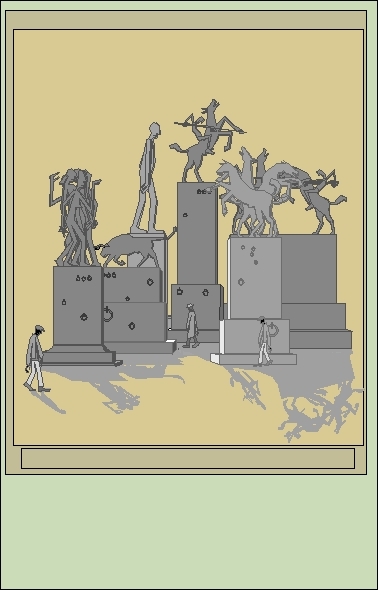 He, as a rule, was loathe to include any accoutrements in his Sculpture. No clothes, ?eyeglasses, weapons or any “props”, as he called them. The figures were to be essences of figures. In his portrature work the only thing that gives a clue to the personality involved is the stature, the posture or perhaps the rotundity of the individual involved. The letters of the persons name on the base would tell one who a portrait was of. The use of the spear was Massee’s nod to the Western Art Genre. Giant Plaza, in Beijing, China is typical of the environmental work that Massee was involved in. 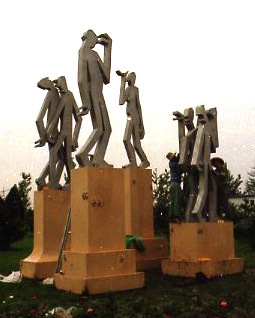 The ten foot high figures on the four bases create a small Plaza. The play on words in the choice of title for the work is typical as well of Massee’s sense of humor. 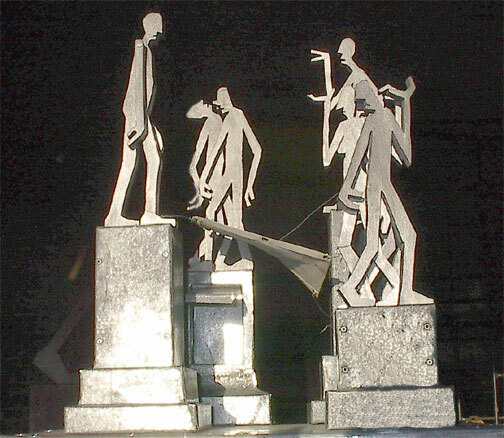 When he proposed this work the selection committee wanted to have only one of the four Sculptures made. Massee sent them a model of the work in it’s entirety and it was decided that the whole Plaza should be made. The construction of models of these large environments was crucial to their being realized. 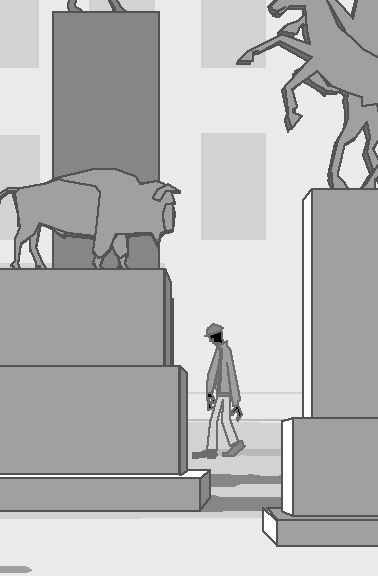 A model, in glavanized steel, for one version of Giant Plaza. 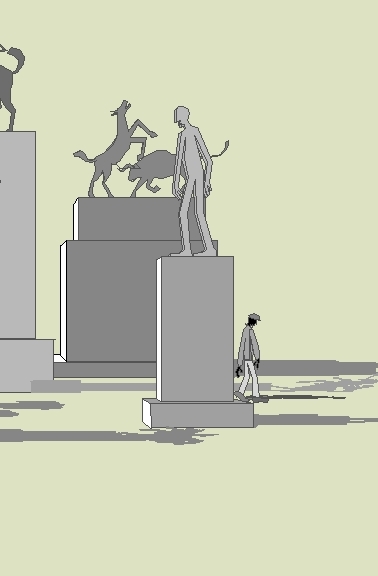 The phenomenon of grouping many Sculptures together to create an environment went through many stages. 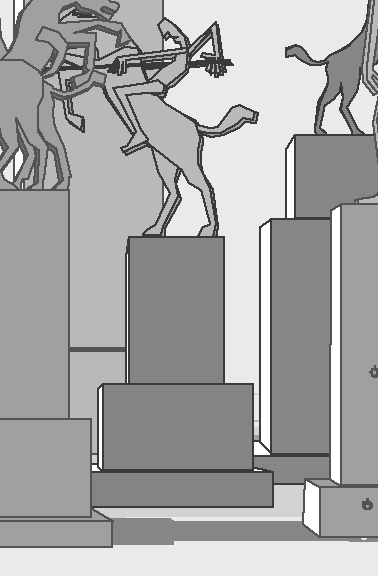 From the drawings ?to the finished model to the realization of the actual Sculpture involved many steps.